A new list I’ve started is a “some day” list. This list contains things that someday I want to do. They are inspired by people doing them for me and they mean so much that I want to do them for someone someday, or they are things I see others doing that I want to also do when the time is right. Many of these things are related to my children when they are grown, things to write about, places to go, hobbies to try. My friend, Blair’s mom, Ruth, has sent amazing baked goods to me via Blair as a THANK YOU for loving her daughter in Nashville, being a home away from home for her, as she lives a few hours from home. She sent these INCREDIBLE oatmeal raspberry bars which I love, and a lovely plump loaf of her homemade whole wheat bread. She included a lovely note of gratitude. Little does she know that WE are the blessed ones! Blair’s wonderful presence and friendship to our family is a gift. (I thought to myself, “do this someday”! When my kids are out of my nest. I want to show gratitude via notes and food to those who love and take them into their families and homes). When Dave and I bought our first house, I was so excited to have a home and super excited to have a porch on which to rock. Evidently, I had expressed this dream of porch-rocking to my coworkers at Oasis Center, because the week we moved into our house, we arrived home to our new house, to find a rocker on the front porch with a large bow on top with a card attached. They put their money together and bought and delivered a rocker to the porch of my new house. A dream come true- a house with a porch and a rocker to rock in. It was an overwhelming and unforgettable moment many years ago, where I felt so supported and celebrated by my co-workers about something happening in my personal life (buying our first home). It meant the world to me! My friend, Hannah, told me many moons ago about something her mother-in-law did when Hannah went to visit. Her mother-in-law would have fresh flowers and a magazine on the bedside table in the guest room where they would stay awaiting her when she arrived. She said these lovely touches made it feel like such a vacation to visit their home and she felt so honored and welcomed. I want to do that someday!I hope someday if Asher marries, I can bless his wife with lovely touches like that. I expect the way I will love Lainey and Lucy’s someday-husbands will be cooking their favorite foods, like my mom has so wonderfully done for my husband. These are a few of the items on my “to do some day”list. 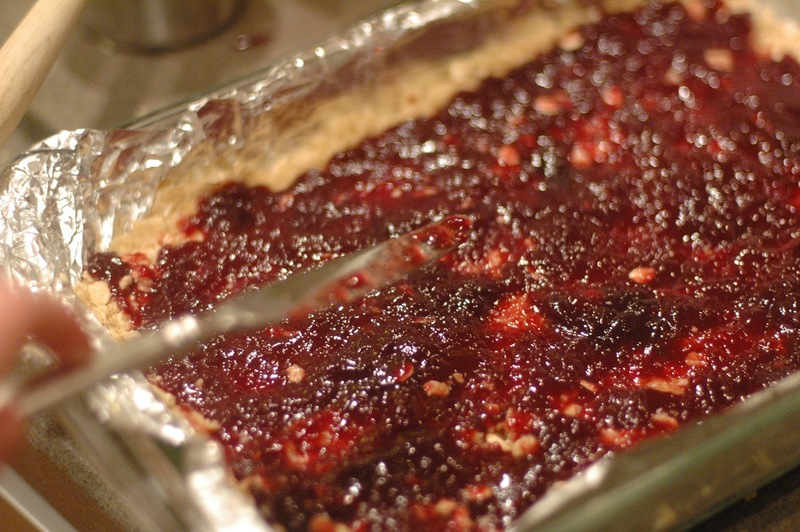 In the meantime, I am making these oatmeal raspberry bars when I need an easy to make, tasty treat! There are many versions of this recipe with little differences. I think one (Ruth’s) is a winner. It has so few ingredients! 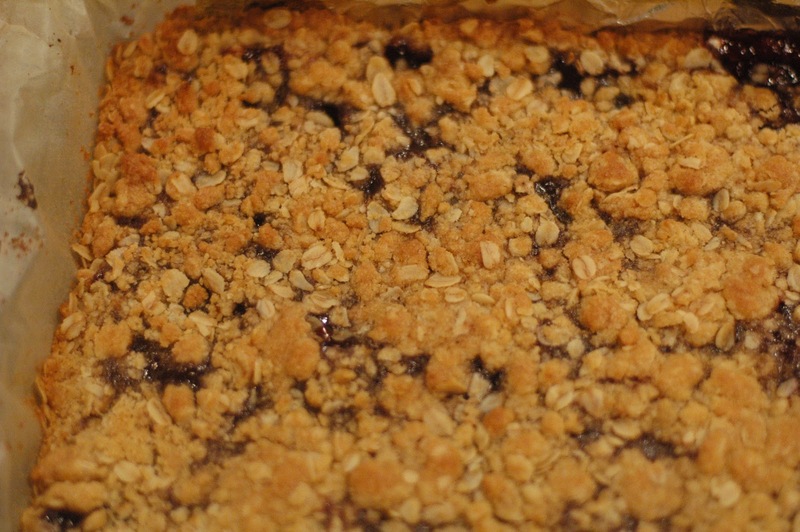 The ingredients are lots and lots of butter, brown sugar, oats, self-rising flour and raspberry jam. This recipe is simple and yummy! 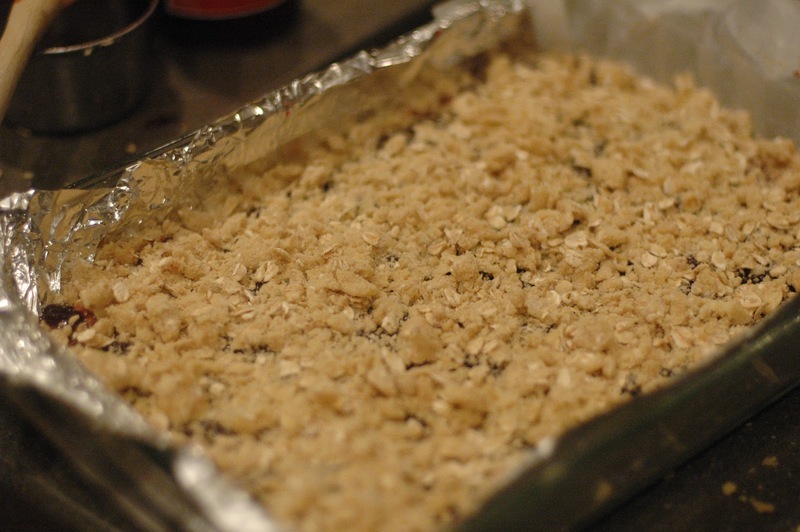 Mix first 4 ingredients with hands until crumbly. Spray a 9 X 13 pan with cooking spray. Line pan and up sides with foil or parchment. Spray the liner. Pat half of the mixture into the pan. 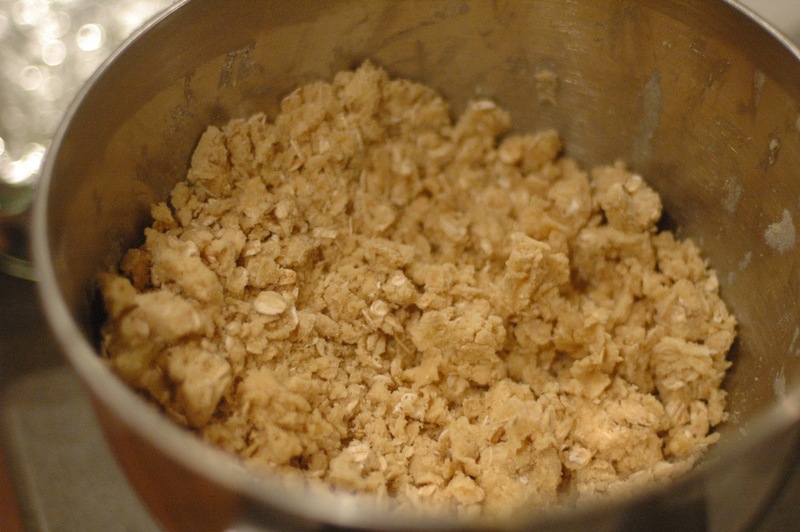 Spread jam over the first layer and top with the remaining oatmeal mixture. Bake at 375˚for 30 minutes or until golden and bubbly. Cool and cut. You can add toasted coconut, or change the kind of jam. You can make them in a smaller pan if you want them thicker. You really can’t go wrong, I don’t think. Thank you, Ruth, for inspiring me and sharing your daughter with us! I hope my kids will bless families they meet when they leave the nest, like Blair does. And I hope I will be as thoughtful to those people as you have been to me. 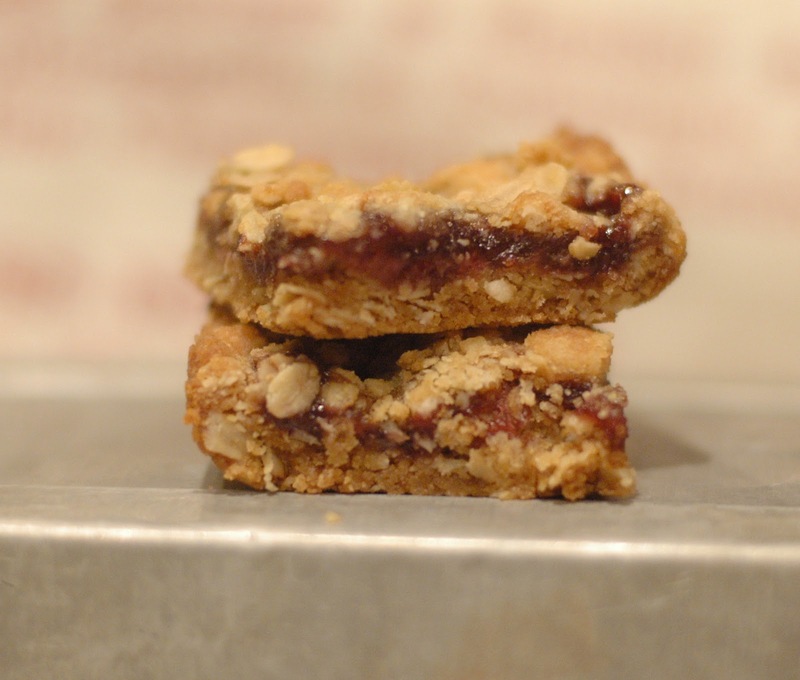 Yesterday, I was telling my mom I wanted to make something “oatmealy” and something from your blog for our community group goodie next week, so I checked your blog and couldn't believe the rasberry oatmeal bars were the post! So I will try them! (Maybe just on my mind from last week.) Anyway, love the post, and the lists! Kristin, MAKE THEM! They are the ones from our retreat. I love the timing of this for you. Let me know how it goes. Thanks for reading and joining the conversation! Hi Julie, I truly enjoy reading your blog. I don't always comment as often as I'd like (especially when I read on my phone and blogger does not make it easy to comment from a phone at all) but today I am reading on my computer and commenting! Yea! These are all such neat things. As I began reading your post I was reminded of this post by another blogging friend. It is not exactly the same type of things as on your someday list but I thought you might enjoy it too. I especially liked the mother-in-law item on your list. I too am blessed with a great mother-in-law. I'll bet you'll be one too! this is one of my favorite posts yet!! love this!! inspired to love people in my life well today!!! Miss G: Thank you for writing. I wish it was easier to comment on blogs from our phones…so frustrating! I love hearing from you and love the connection you made the with other post. I love that “someday jar” idea. And Jennifer- I am honored that you are inspired to love well from my post. What an honor! I am making these for my community group this week too! I love that I can try out a recipe from your blog & know that it will be good (as long as I follow the directions–ha)! I want to sprinkle chocolate chips over the top when they come out of the oven, but I'll try that variation next time. Thanks for the timely post! Oh Nanette, that's a great idea. I think I would either do mini chocolate chips on top OR chocolate chips in the filling layer on top of the jam. They would be less messy that way. Let me know if you try it!